After a delayed but rousing start, the promise of a glorious spring at Hayefield has pretty much fizzled out, due to the unusually dry conditions. Though other places near here have been blessed with some of the wet stuff, our little corner of the county has received exactly 0.0 inches of rain in the last 3 weeks. 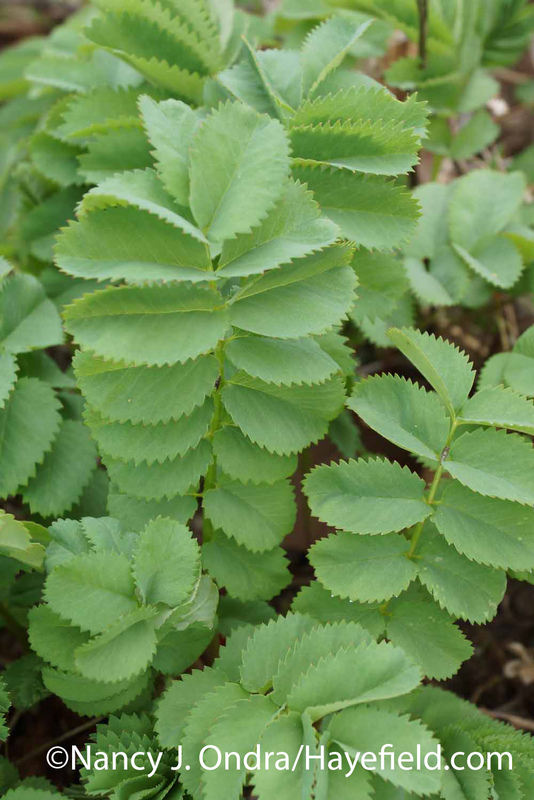 On the whole, I prefer a spring that’s on the dry side; if there’s regular, abundant rain through April and May, the plants produce soft stems and lush leaves, then struggle once the usual summer dry spells start. But really, no rain is tough to deal with. Instead of planting and weeding, I’ve been spending most of my gardening time hand-watering the new grass paths. It’s keeping the seedlings alive, but even after a month, there’s still just a light green haze–except for some lush green patches where the Canada thistles are thriving (sigh). 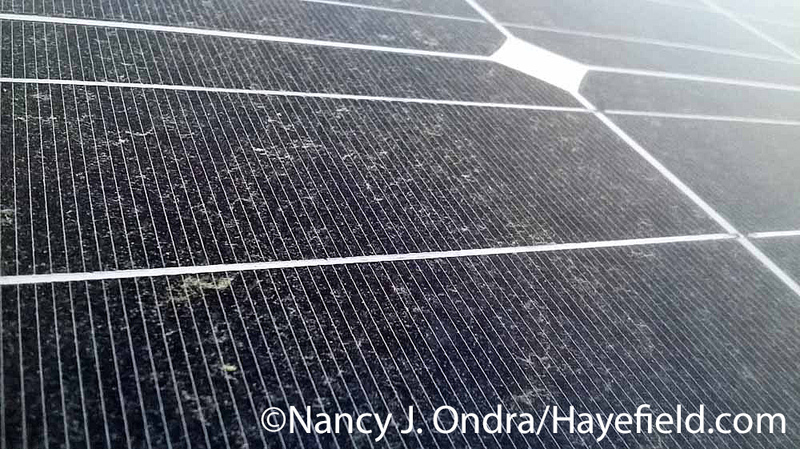 The solar panels have a hazy covering too: of yellow pollen. It’s putting a dent in their production, but giving them a good scrubbing isn’t high on my priority list at the moment. Still, the season so far hasn’t been a total disappointment. In fact, I’m pretty pleased with the progress I’ve been making in adding more early-season interest. 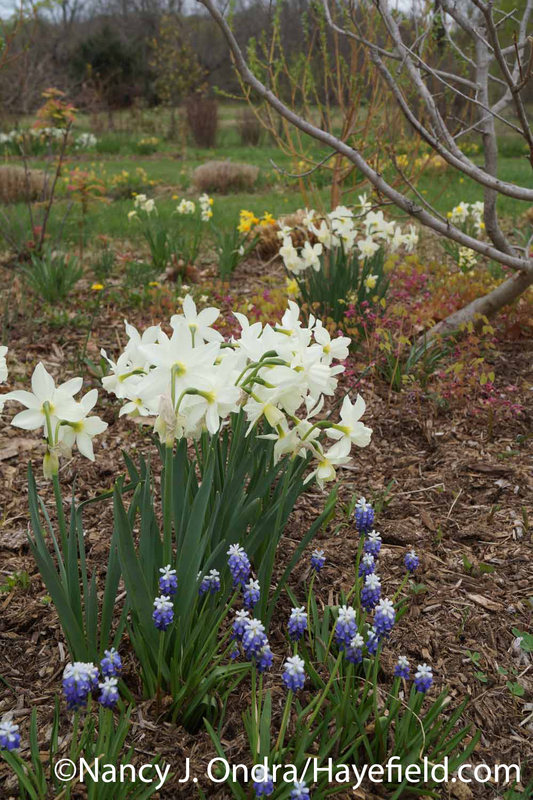 Bulbs are generally dependable, so they were an obvious choice. The ‘February Gold’ and ‘Tete-a-Tete’ daffodils have been thriving and multiplying in the beds and borders outside the fence. 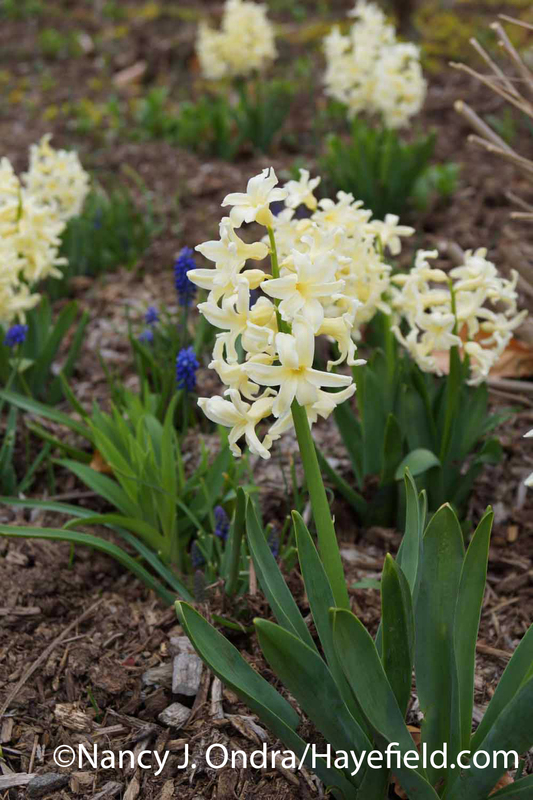 For “something different,” I thought it would be interesting to try ‘Yellow Queen’ Dutch hyacinths. They’re nice, but with the yellow daffodils flowering around the same time, these just looked washed out. Adding some blue or purple ones, or maybe some more grape hyacinths, would probably help. I didn’t have high expectations of the checkered lilies (Fritillaria meleagris) when I planted them, but they have been terrific: not only are the original bulbs increasing, but I’m starting to find some seedlings as well. Two years ago, I planted loads of what was supposed to be Muscari armeniacum. The bulbs didn’t flower last year, because either the deer or rabbits nibbled them, and I forgot they were even there. Seeing these beautifully shaded blooms this spring was a wonderful surprise. As far as I can tell, these grape hyacinths are Muscari auscheri ‘Ocean Magic’. I had added more ‘Thalia’ daffodils at the same time. ‘Thalia’ starts flowering just as ‘February Gold’ and ‘Tete-a-Tete’ finish, extending the daffodil season for another 10 days or so. 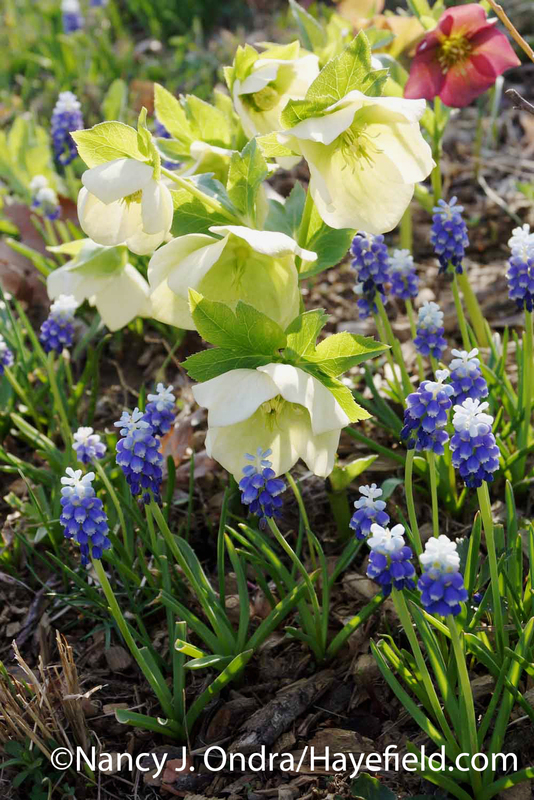 They make a pretty partner for the ‘Ocean Magic’ grape hyacinths, too. 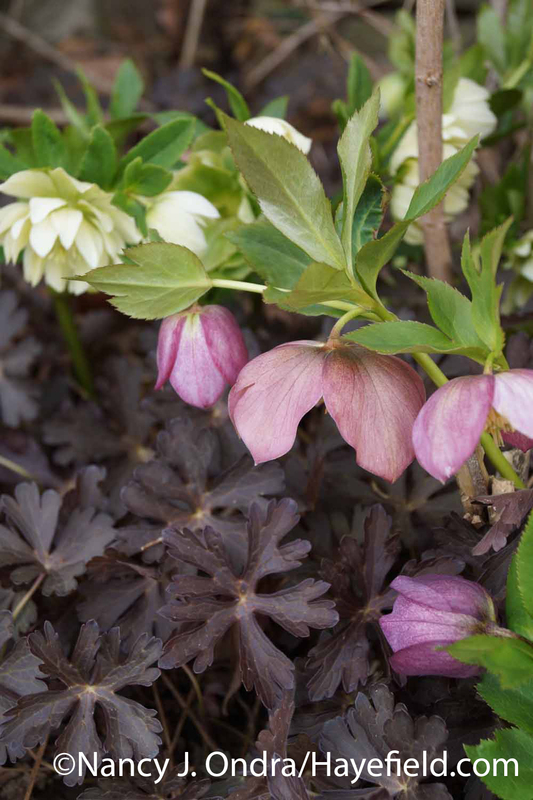 ‘Ocean Magic’ turned out to be a lovely companion for the hybrid helleborus (Helleborus x hybridus), too–particularly the white ones. …and ‘Gravetye Giant’ summer snowflake (Leucojum aestivum). 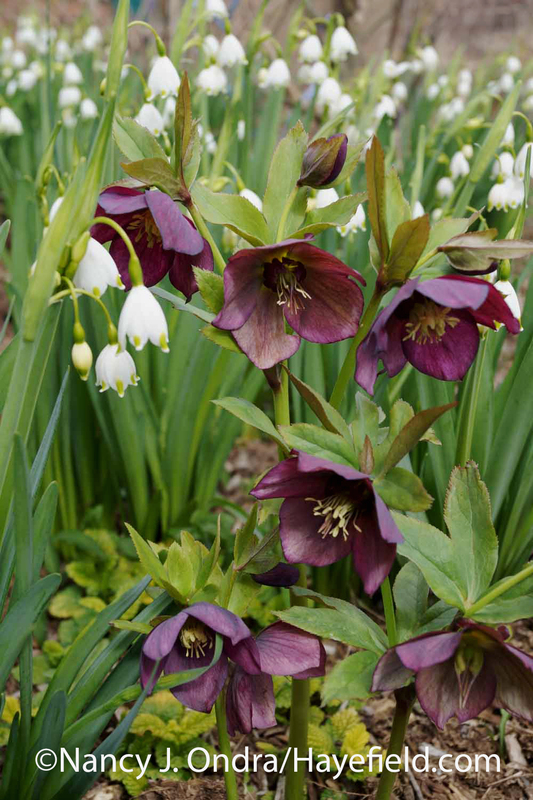 The hellebores are excellent at making their own combinations, too. This one is in front of ‘Gerald Darby’ iris (Iris x robusta). 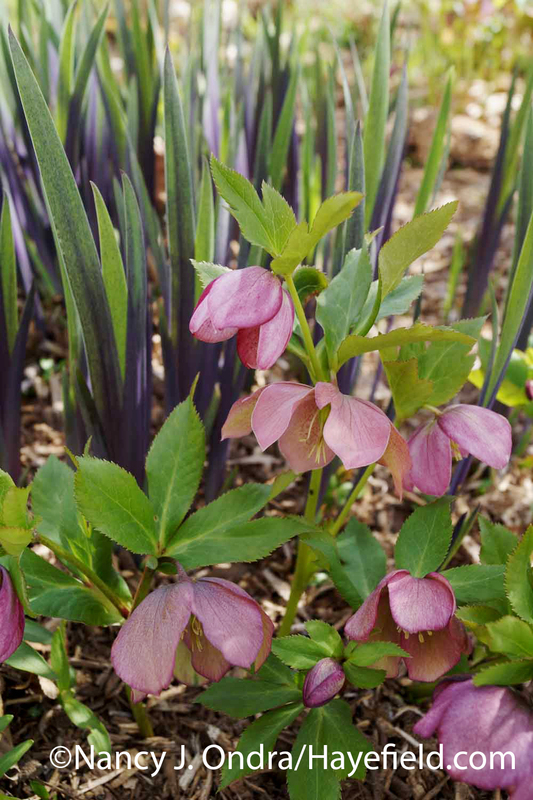 This trio of a plummy hellebore with ‘Chameleon’ euphorbia (Euphorbia dulcis) and the new stems of a native clematis must have been here for a while, but I didn’t notice it until this spring. 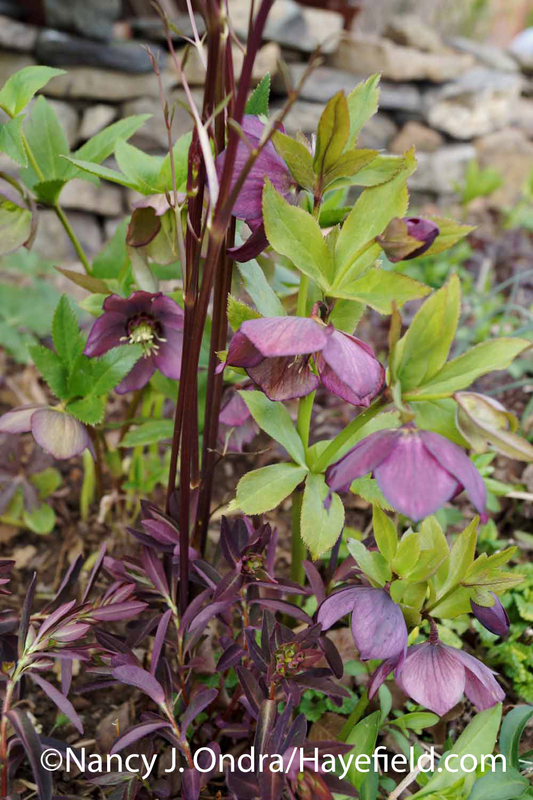 Like ‘Chameleon’ euphorbia (and the hellebores, too), ‘Espresso’ tends to seed itself around to make some pretty partnerships. 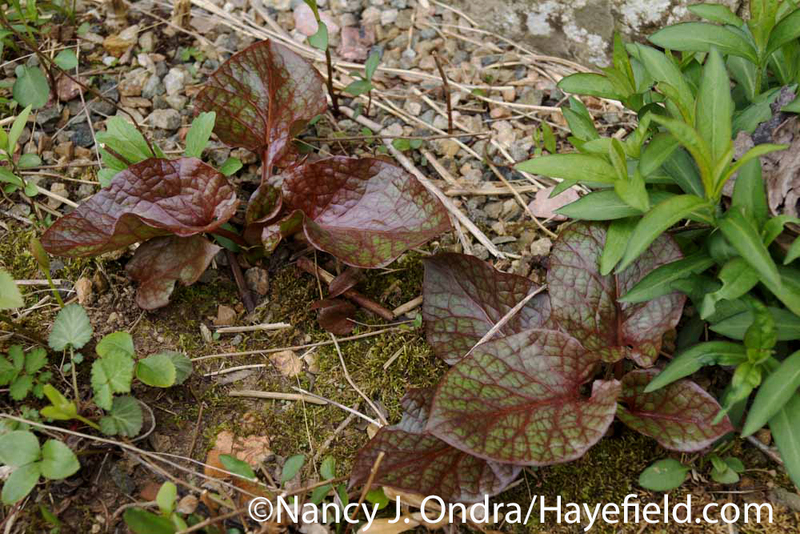 Most of the fancy lungwort (Pulmonaria) hybrids I started with years ago have died out, but I still find seedlings here and there. 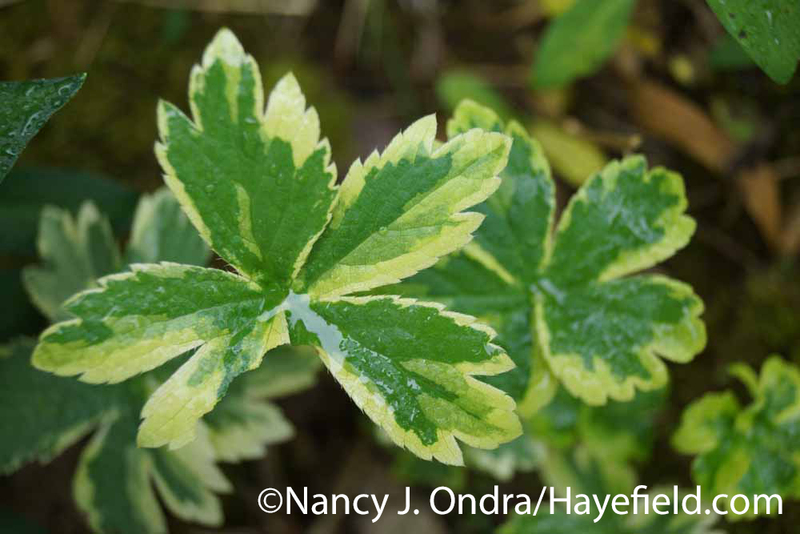 This one sowed itself into a patch of Allegheny pachysandra (Pachysandra procumbens). …and ‘Stairway to Heaven’ has been thriving for about 5 years now. 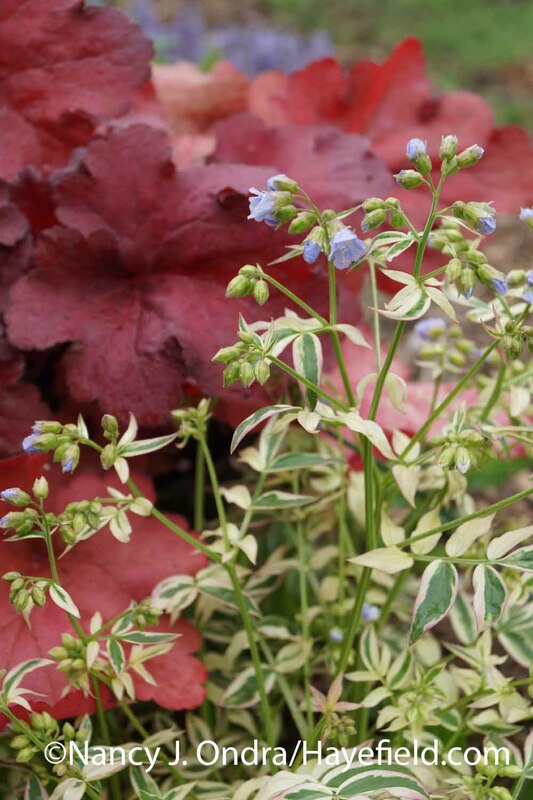 ‘Fire Alarm’ heuchera is a newer addition, to make a showy backdrop for the lacy leaves. 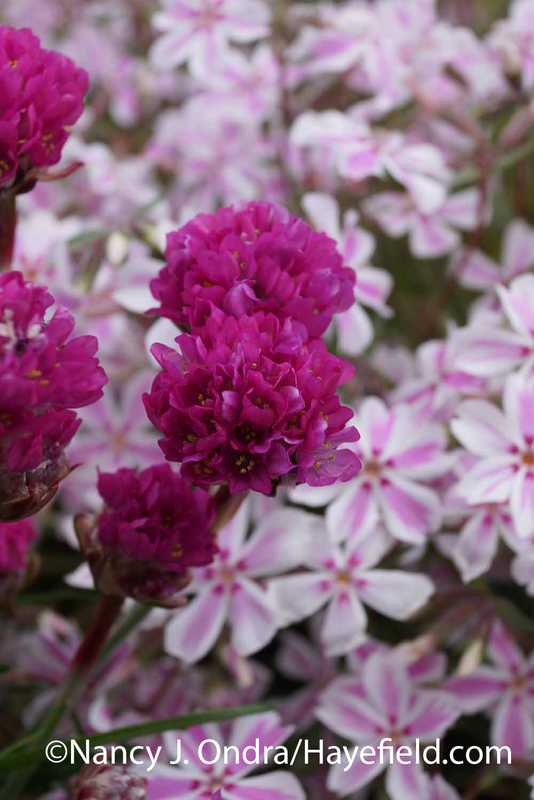 One of my favorite recent pairings: ‘Bloodstone’ sea thrift (Armeria maritima) with ‘Candy Stripe’ moss phlox (Phlox subulata). The phlox stopped blooming a few days ago, but the thrift is still going strong. 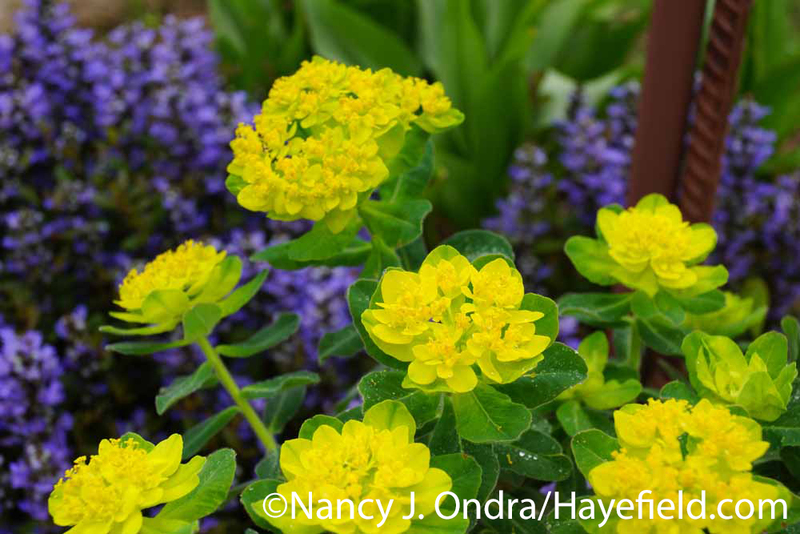 The brilliant yellow bracts of cushion spurge (Euphorbia polychroma) look great with many companions, but wow, they’re stunning against the deep purple-blue of Chocolate Chip ajuga (Ajuga reptans ‘Valfredda’). 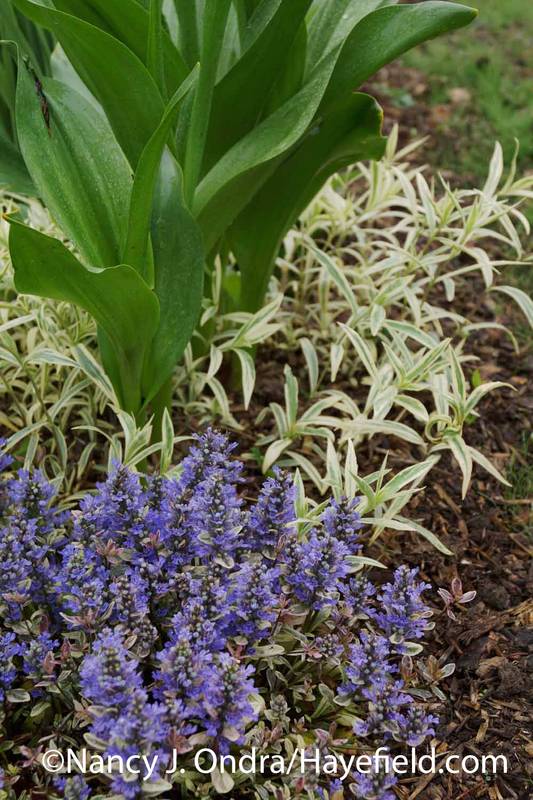 The flowers of ‘Dixie Chip’ ajuga are lighter but beautiful against its own variegated leaves, and against those of ‘Triple Play’ smooth phlox (Phlox glaberrima) too. 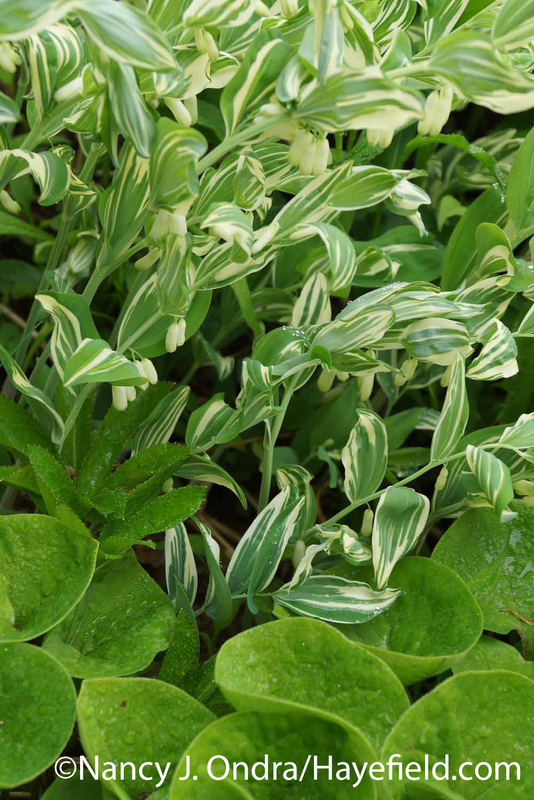 The white flowers of this variegated Solomon’s seal (usually sold as Polygonatum x hybridum ‘Striatum’ or ‘Grace Barker’), on the other hand, are almost invisible against its wildly striped foliage. 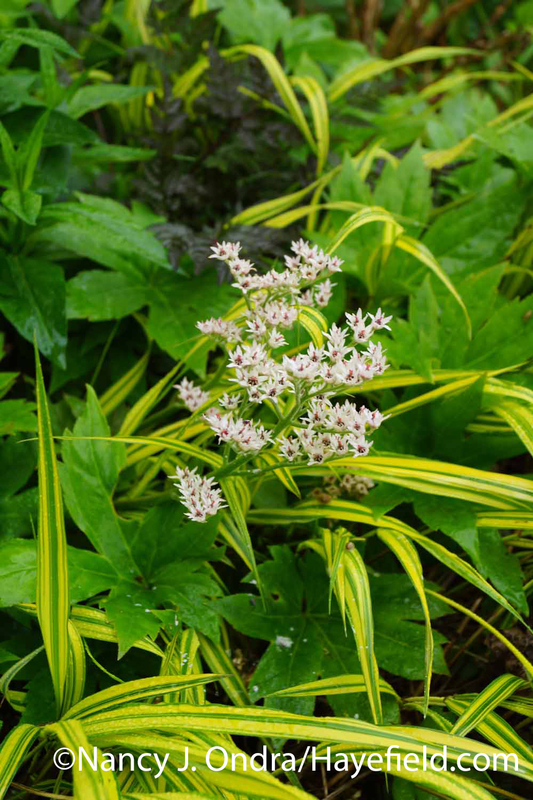 It’s a beautiful perennial, though, and surprisingly vigorous for such a vividly variegated plant. Mukdenia (Mukdenia rossii) isn’t nearly as showy or as vigorous here, but it’s quietly pretty. ‘Mostly Ghostly’ hosta keeps getting better year after year: surprisingly vigorous for a plant that spends its first month with hardly any chlorophyll. My luck with epimediums seems to be increasing. I’d stayed away for them for a long time, since I have very little shade, but the few I’ve added tolerate a lot more sun than I expected. I don’t remember planting these yellow ones, though; I’d have sworn these were all red for the last few years. Honesty (Lunaria annua) is a plant that I used to be able to grow beautifully but have had trouble with since I moved here. I’m thrilled that these ‘Pennies in Bronze’ have made it, finally. The flowers have a richer purple color than I expected; now, I’m looking forward to seeing if the seedpods match the one photo I’ve seen of them. If they are that good, I hope to have lots of seeds to share in the fall. 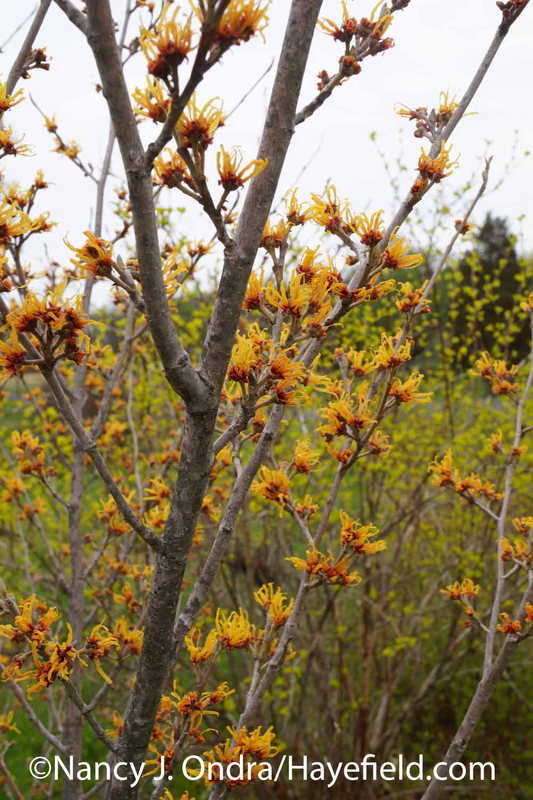 …and the also-wonderfully-fragrant ‘Orange Encore’ witch hazel (Hamamelis x intermedia). It’s one of the last witch hazels to open but worth waiting for. The white flowers of ‘Dart’s Gold’ ninebark (Physocarpus opulifolius) won’t bloom until June, but the bright new leaves make it look like it’s in flower through a good part of the spring. 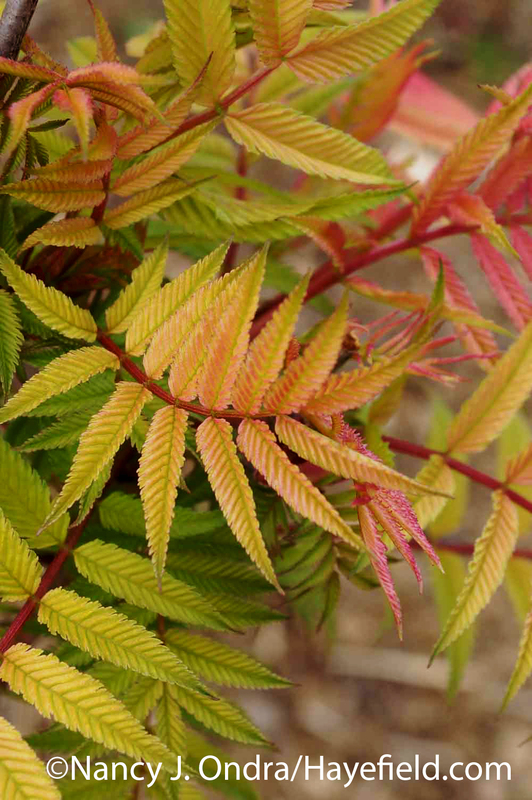 ‘Sem’ sorbaria (Sorbaria sorbifolia) is also a splendid sight in leaf. Sanguisorba armena isn’t as dramatic in color, but it’s beautiful in its own way. …and seedlings of the above. …and the one below, as well. It’s been so long since the original plant flowered that I can’t remember for sure. I’ve been watching these for about 6 years now, and I think they are finally planning to flower this summer. Shredded umbrella plant (Syneilesis aconitifolia) is always worthy of at least one photo. 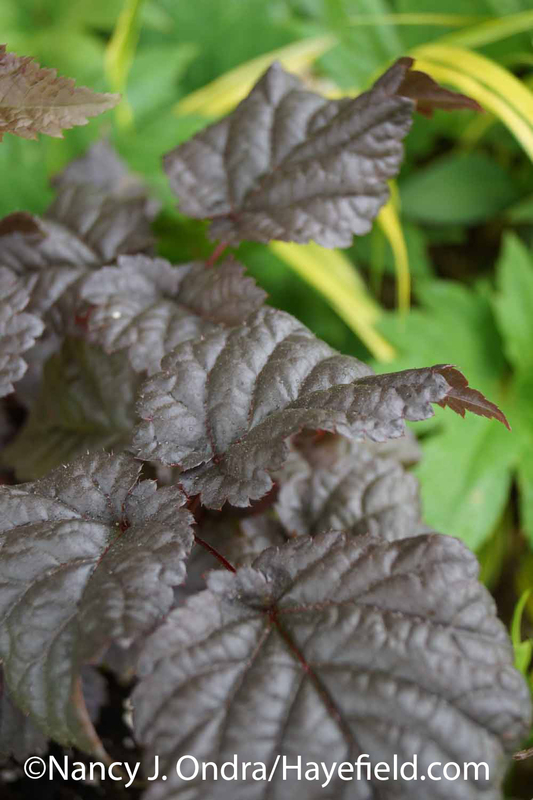 And last, a new find for this year: ‘Chocolate Shogun’ astilbe (Astilbe), which seems to be holding its dark color well, even with the hot spells we’ve had so far. 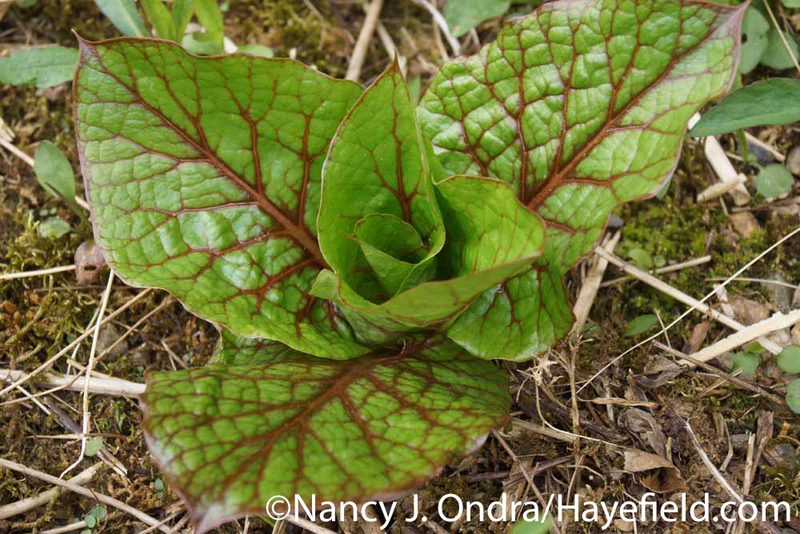 …and eat your weeds, too, if they’re edible. 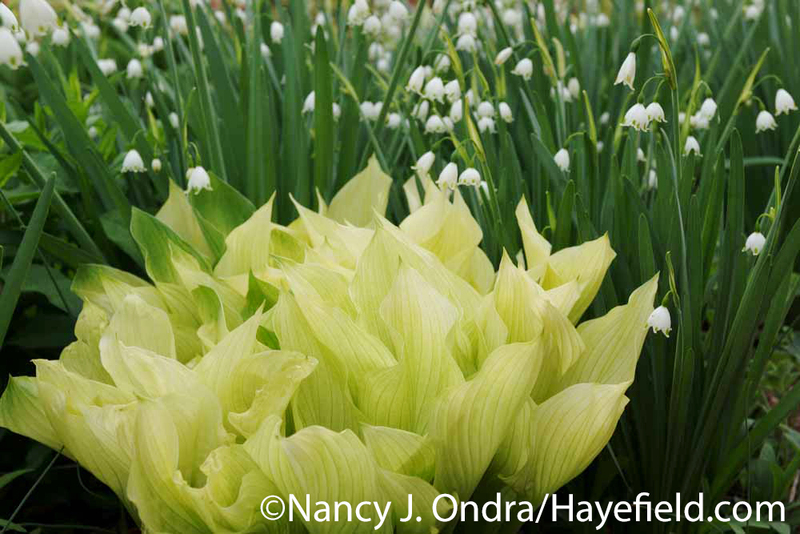 To see more spring beauties, visit Carol’s main Bloom Day post at May Dreams Gardens. A lovely garden! Tanka for all i inspiration and lovely combinations. Good morning, Inger. Thanks so much for visiting! Another beautiful posting! I discovered your blog last summer and you have opened a whole new world of planting possibilities I never knew existed! I am currently deciding on a companion plant for my winterberry. I’d like something with bronzy red foliage to pick up the red stems in the winterberry. 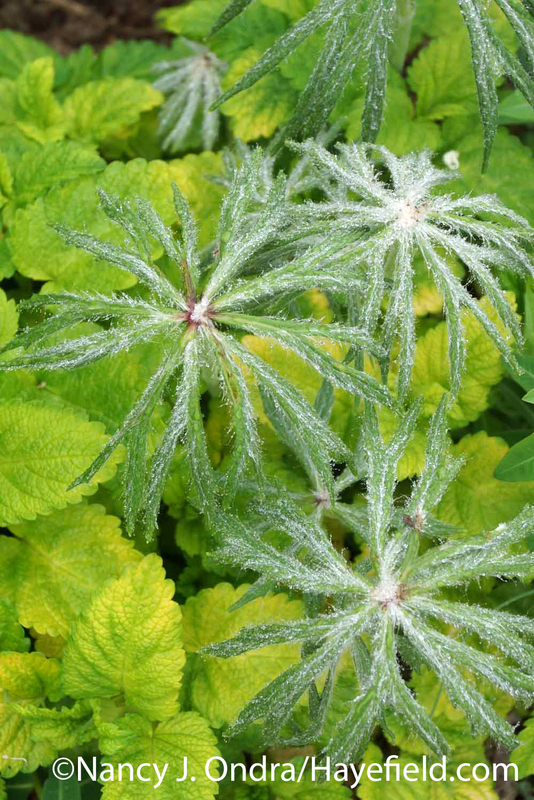 I already have several dark coral bells nearby and would like something different. Does your ‘Expresso’ geranium hold it’s dark color all summer? One last thing. I love the look of your gravel paths with the wood slats in it. When you have time, could you explain what you used to build it and what you do to maintain it? Thanks so much for sharing your garden with us! Hi Debbie–‘Espresso’ isn’t quite as dark later in the season, but it’s still brownish through summer and into fall. I too really like the timber-and-gravel path; it’s held up very well over the years. I’ve written about it in most detail in an old post over at Gardening Gone Wild: http://gardeninggonewild.com/?p=366. Your photos are magnificent and give me plant envy for so many of the plants you showed us! Thanks so much, Ruth Anne. Sorry to make you envious; I’m sure you already have lots of lovely plants. Happy Bloom Day! Lovely colors and combos as always — thanks for sharing. And I share your pain with the Canada thistle. 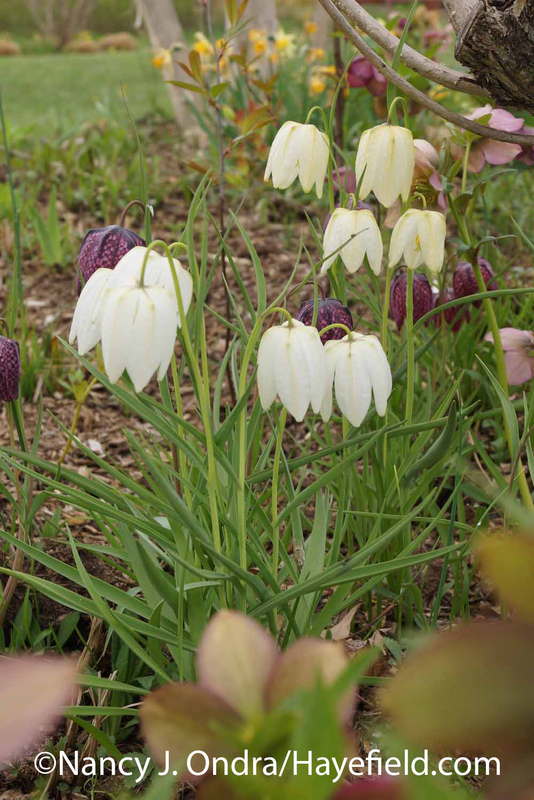 Love those fritillaria and have your seeds from the HPS exchange and one day, maybe flowers! Bone dry here, too. Happy gardening! Hi there, Tiiu. Sorry to hear that you too are battling Canada thistle–not in your “weed border,” I hope! Let’s keep our fingers crossed for a good soaking rain soon. Happy May Bloom Day to you and your boys Nan! Thank you once again for sharing your beautiful garden and plant combinations, always a delight. As soon as the e mail arrives in my mail box I am eager to get to your latest postings. I cant imagine how difficult it must be to cope with such a long dry spell, here in the North West of England we are never short of water, in the form of rain. However after saying that I have had to start watering plants in pots, as it has been very warm and windy recently. I do hope you get some rain soon, to irrigate your beautiful plant filled garden. Good to hear from you, Allan! This dry spell is unreal, and very unusual for us. It’s a good thing I didn’t plan on planting too much, because the ground is too hard to dig. Looks like we have a few chances in the next week, so maybe I’ll be able to get the few things I’ve been holding into the ground soon. I hope you thoroughly enjoy your spring! You must be getting some more shade . I don’t remember seeing heucheras in your garden before. I enjoy them so much , though my success is mixed. That hosta Is incredible! And I love the dark fritillarias. I need to try those again. Happy spring, Amy! Yes, I’ve getting more shade now (finally! ), but I think the credit for success goes to the heucheras themselves. I too used to have trouble with them, but in the last 5 years or so, the newer hybrids seem to be doing much better. ‘Caramel’, ‘Southern Comfort’, and ‘Obsidian’ have been outstanding for a number of years. ‘Lava Lamp’ and ‘Fire Alarm’ haven’t been here as long, but they’re still much more vigorous than the older hybrids. I am now solidly a heuchera fan again! Thanks for the update, Nan. I enjoyed it immensely. In particular, the Dart’s Gold interested me as a candidate for wet boggy conditions in winter followed by 4-6 months of drought. I loved the flowery look of the leaves, as you pointed out. Almost like a forsythia look-alike. Dry here in Victoria, too. We did get a little overnight shower but it was soon negated by drying daytime winds. Hope you enjoy the remainder of your May. I’m so sorry to hear that you’re so dry too, Barbara. Yes, ninebarks mostly do just fine here with winter-wet and summer-dry conditions. 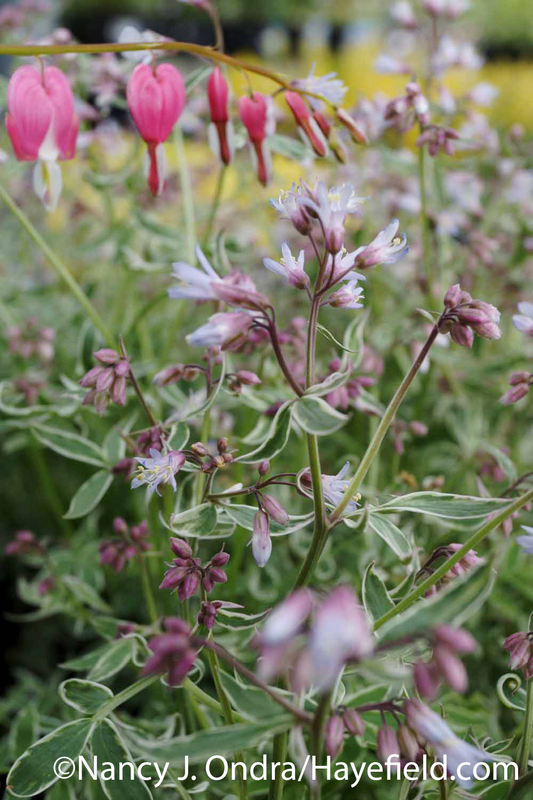 Many of my dark-leaved ones are struggling right now–they had powdery mildew last year and are struggling to leaf out this spring–but ‘Dart’s Gold’ and its seedlings seem much tougher. 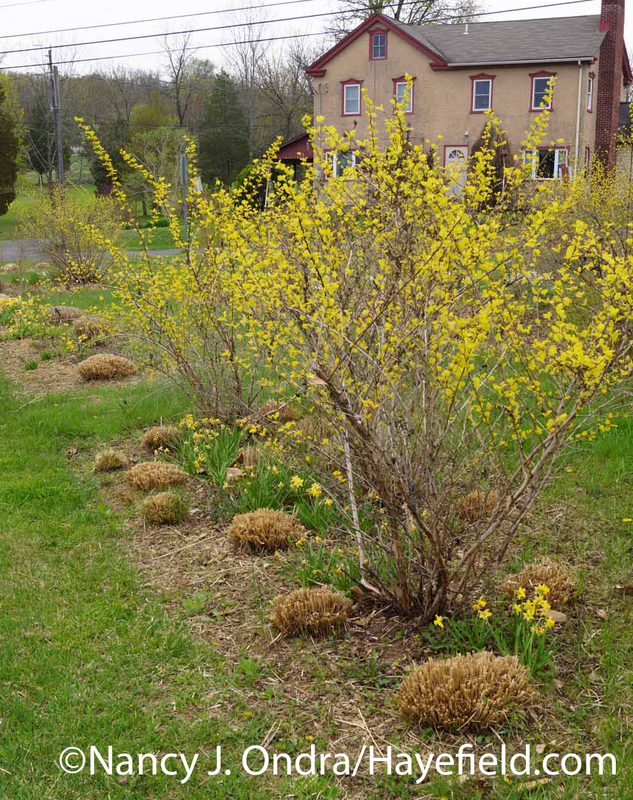 You’re right: the bright yellow leaves do make them look like forsythias in bloom, but in a nice clear to chartreusey yellow instead of golden yellow. Really enjoy visiting your garden and seeing all the pretty flower combinations via the internet. We are relandscaping our garden, greenhouse areas using many of your ideas & planting combinations, books and Plan Garden Software. You have a real talent for design !! God Bless you for sharing your skills with us all. My little garden is located in Southern Maryland not to far from the Potomac River and backed up to park woodlands allowing me to try out many types full sun & shade combination. Recently I’ve just started about 40 ostrich ferns & bleeding heart plants in the greenhouse for the woodland and sloping yard areas. So far the ferns are taking root. So exciting to see them grow & love that the deer don’t like them. Thank you so much, Lorri! It’s always wonderful to hear that people find my books useful. It sounds like you have a wonderful spot for gardening. If you have room for 40 ostrich ferns, it can’t be *too* little! Best of luck with your new additions, and with your whole gardening season. Your Thalia daffs are so elegant. 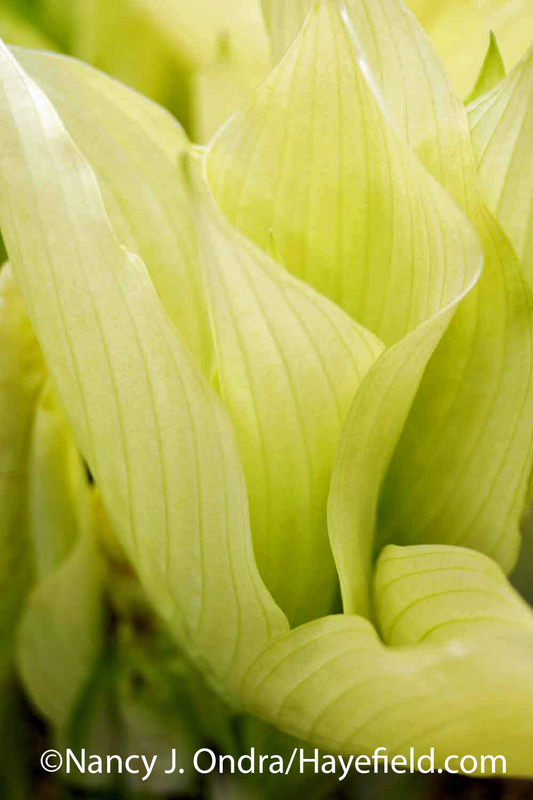 And you mostly ghostly hosta is giving me plant lust. 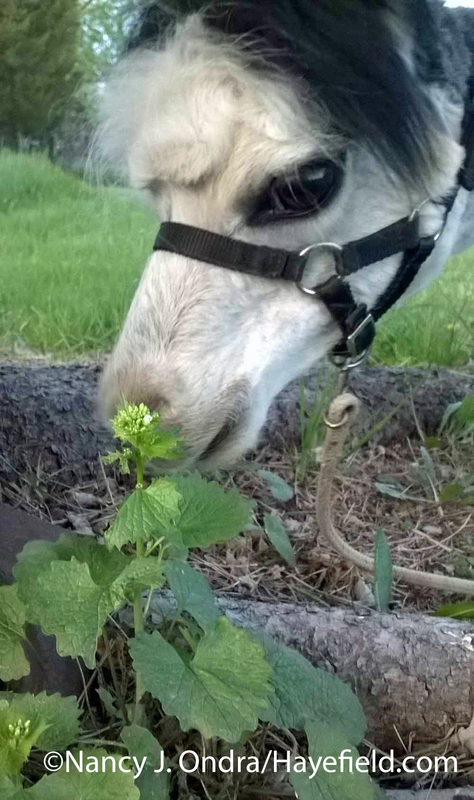 Thanks for sharing your garden adventures with us! 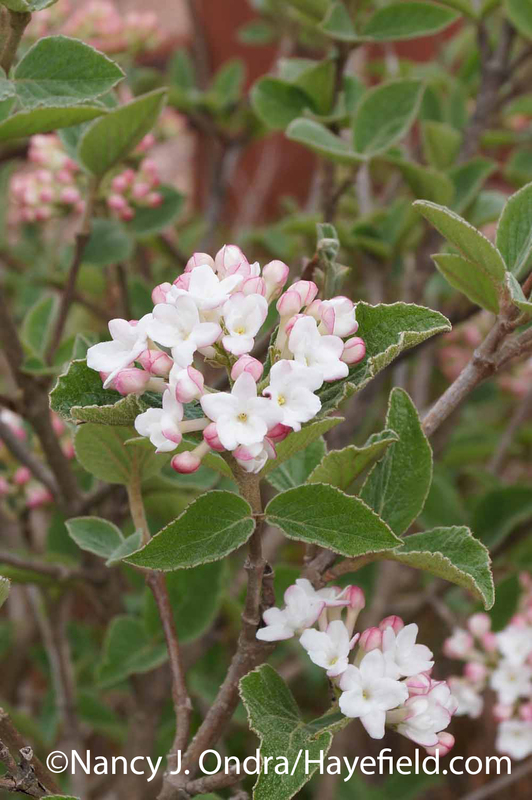 Elegant, for sure, and vigorous, and wonderfully fragrant, too, Paula; ‘Thalia’ is a winner. 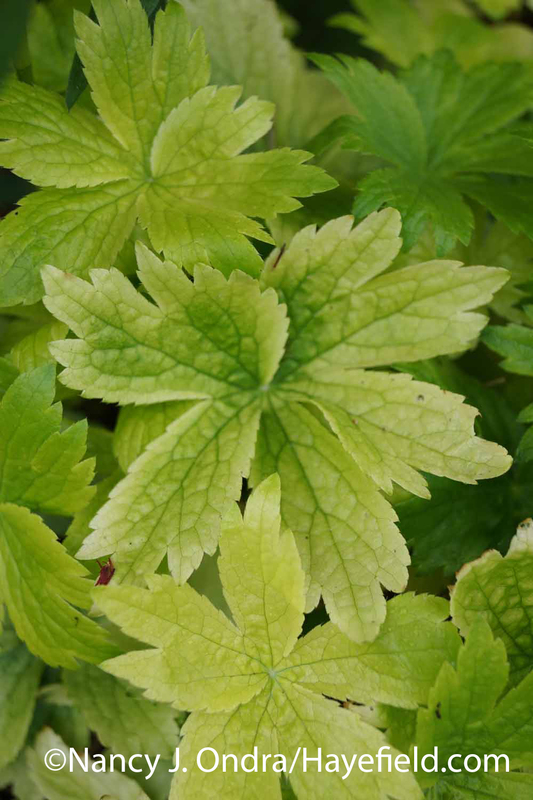 I ought to warn you that ‘Mostly Ghostly’ is “mostly ghastly” for much of the year–a sort of streaky or speckled light green–but it’s so glorious in spring that much can be forgiven. I can certainly sympathize with the problems dry spells present! But we’ve had 2 rainstorms here in SoCal this month, a virtual miracle for us in May. I hope you’ll be lucky too and that Mother Nature will come through. 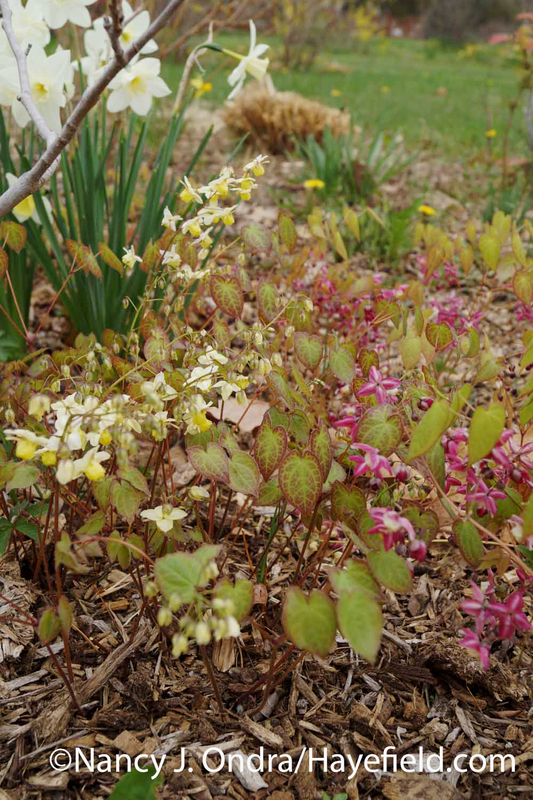 As usual, your photos are gorgeous and had me pulling out my western garden guide to look up Sorbaria and Syneilensis, among other plants – both would push my zonal denial too far, though, and thirsty plants are off the menu here for the foreseeable future. It’s pretty bad when California has had more rain than we have. But I’m very happy for you, Kris; your situation is much more serious, and we know we’ll eventually get something. So sorry I taunted you with the Sorbaria and Syneilesis. 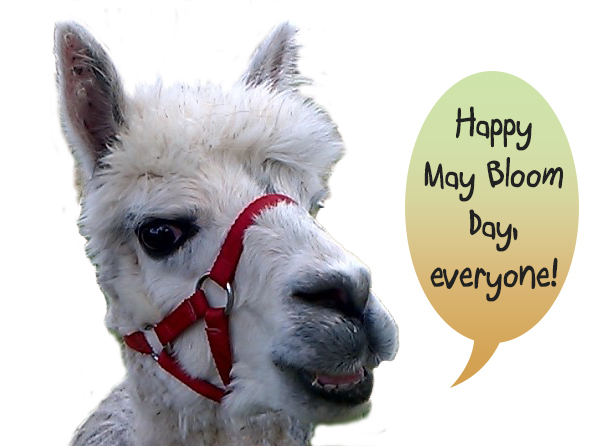 Happy May Bloom Day to you! I’m sorry to hear of your dry weather, I hope things improve. Your garden is looking lovely, I love the Hellebore/bulb stage of spring. 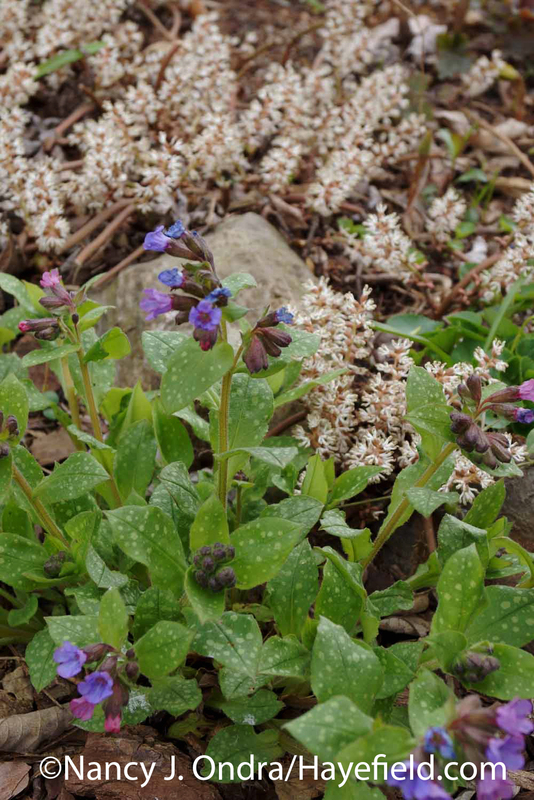 I really like your bright Muscari ‘Ocean Magic’, and will have to look for your pretty ‘Pennies in Bronze’, Lunaria is a favorite reseeder of mine. Thanks for all the inspiration. 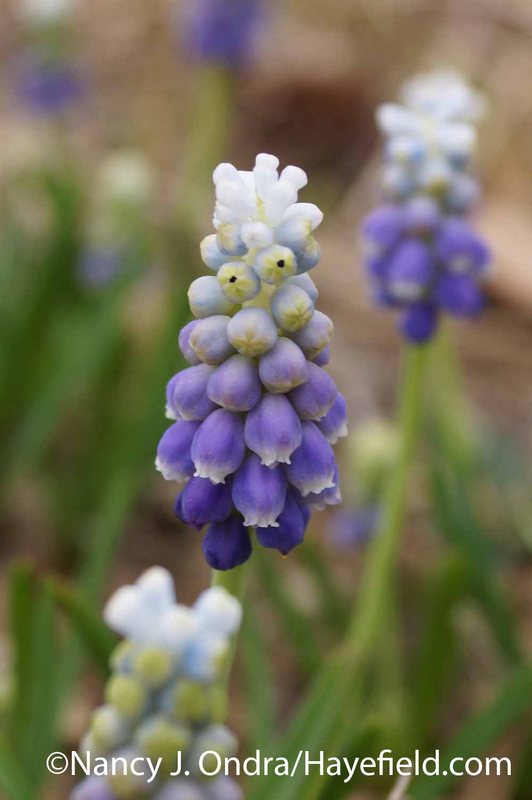 Isn’t that muscari interesting? It was a lovely surprise, since I was expecting the solid purple-blue. I’ve been dumping the boys’ water bucket on the ‘Pennies in Bronze’ each time I give them fresh water, and the plants are looking perkier and setting seedpods now. I will do my best to have seeds available for my fall giveaway. 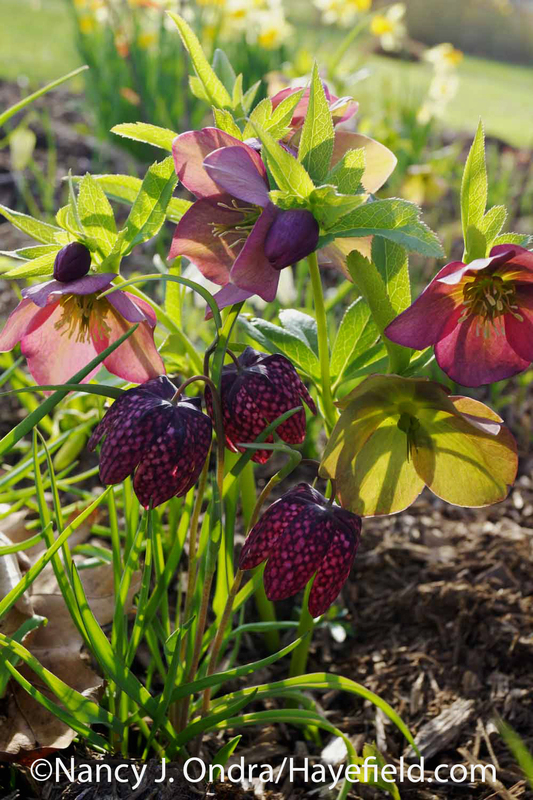 I especially like the photo of helleborus and Fritillaria, with the sun behind them — illuminating them inside. That was a beautiful evening, Ray. I took many beautiful pictures in that low-angled light, but that shot was one of my favorites too. Thanks for visiting today! Beautiful combinations! Love that iris ‘Gerald Darby’. Stunning foliage. It is, isn’t it? It’s mostly green now but stays good-looking through the rest of the season. Happy spring, Layanee! As usual I thoroughly enjoyed your Bloom Day post. I sat down with a cup of coffee and slowly strolled through the gardens. I appreciate the combination photos, and ended up Pinning a lot of them. I have never heard of or seen a checkered Lily -but it is AMAZINGLY Adorable!! I tell myself I have no more room – but, surely I can make room for one (or more) of these! I’ll check them for my zone 6. Thanks for the extended bloom time daffodil pairing. Those few long anticipated weeks go by so fast!! The ‘Gerald Darby’ Iris was also new to me – have to check that one out as well. I’m certain you can squeeze in some of the fritillaria, Shelley; the bulbs are small and take up no room at all. Have fun with the new combination, and thanks for the good wishes for rain: we’ve had about a third of an inch in the last week but no hope of more for another week yet. Hi there, Greg! Thanks so much for stopping by for a visit. 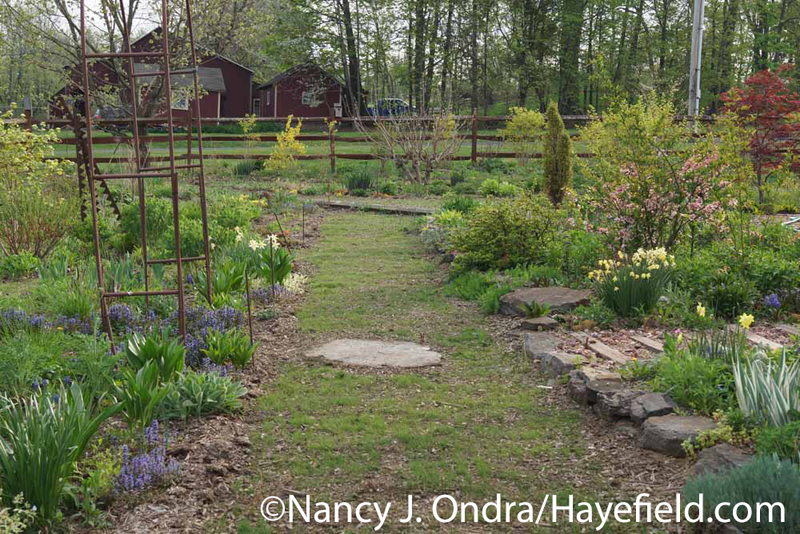 Hope all is well in your garden this spring! 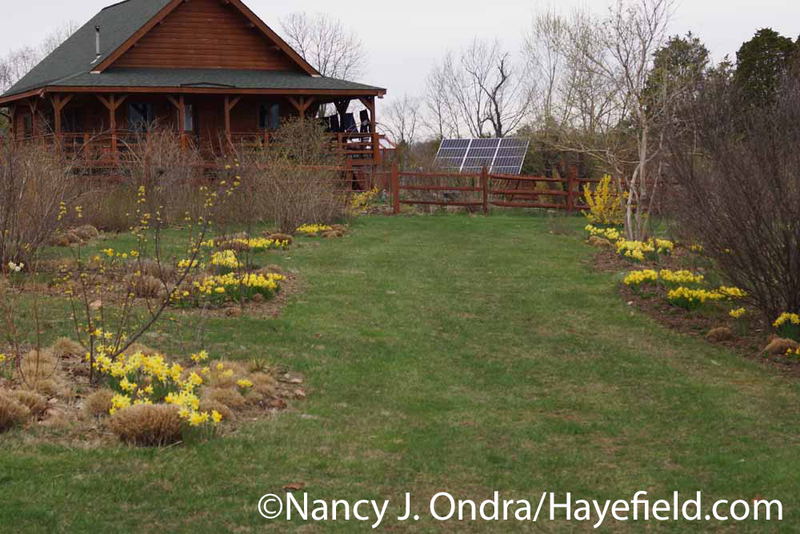 Yikes, looking at the photos of hellebores and daffodils makes me realize how behind I am on getting to your blog! So worth the wait though, it’s always a pleasure to see what you’ve been up to. The paths look better than you give them credit for. I don’t envy the thistles but the new look should work out great by next year… And hopefully this summer as well! The watering stinks though. Love the lunaria. I looked it up and probably saw the same picture you did. It looks extremely promising! I managed to finally get a few rosemary verey from seed this spring and I’m just as excited about those. Gerald Darby looks great every spring, I love that foliage. 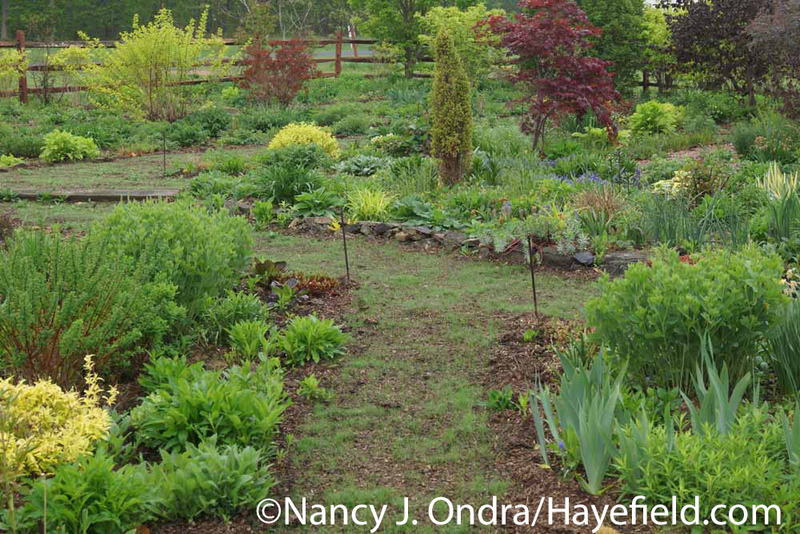 We had some rain Wednesday and it’s amazing how much it improves your gardening spirits! The ground is still too dry for May but at least the grass has gone back to having a green tinge instead of the yellow/brown look. Here’s to a wetter June! Amen to that, Frank. It looks like we *might* get a soaking rain this weekend, but I suspect it may be too late for some things. I gave up on watering the new grass about a week ago, because there were more important things to keep alive, so I’ll have to try sowing again in fall. 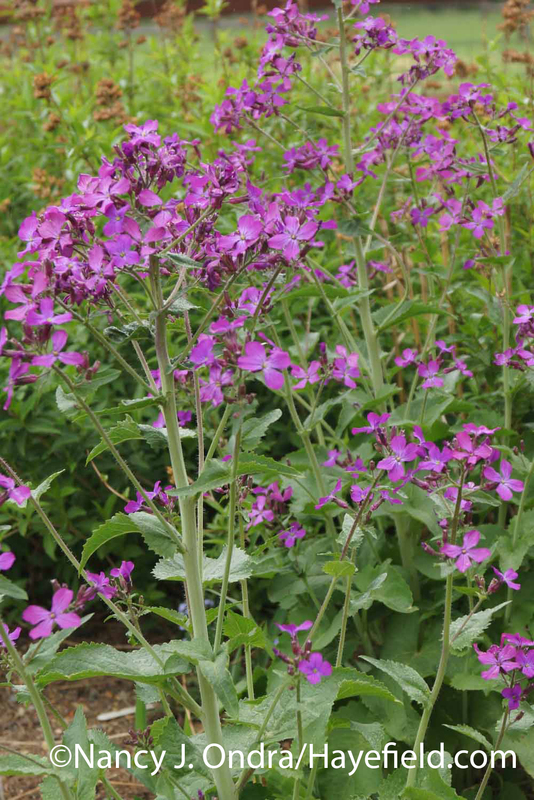 Good for you having luck with the Lunaria ‘Rosemary Verey’; if memory serves, the purplish foliage is very handsome. 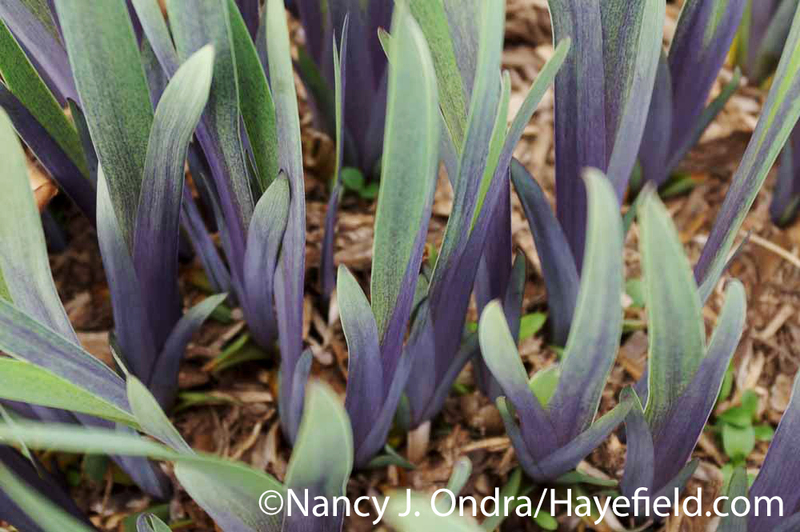 Funny coincidence: I was reading about Iris ‘Flavescens’ on your blog last week, and when Duncan and Daniel took me for a walk that evening, we saw a clump of (what I’m pretty sure is) it in front of an older homestead around here. What a pretty thing! Ha! That iris shows up everywhere and it really is a tough one. I bet your grass will take off as soon as a little rain falls, and as far as reseeding goes I bet you can just mow whatever survives and it will look just fine. Except for the Canadian thistles… Even I would try and get rid of those.